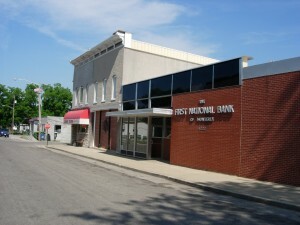 We have continued to work on the Annex addition at the main branch of the First National Bank of Monterey. The new MR-24 Standing Seam Roof on the existing building (previously discussed here) required the extension of the parapet wall on the front facade. We were able to find black panels similar to the existing and have custom formed aluminum spacers to mimic the existing panels beneath them. The effect has been to enhance the look of the existing entrance and is actually quite striking. For security, it was decided that the first floor facade of the Annex should be infilled with brick. Brick similar to that used on the bank was used for continuity. The existing columns and decorative trim was retained as well as the stone steps. In the picture you can see that the center step is well worn by over 100 years of foot traffic. 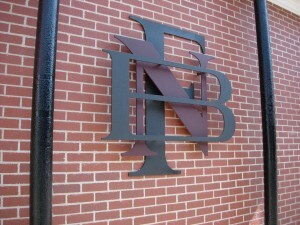 The bank’s logo, an overlaid F, N & B, were custom fabricated by Titus Inc.from specifications created by Easterday Construction Co., Inc. 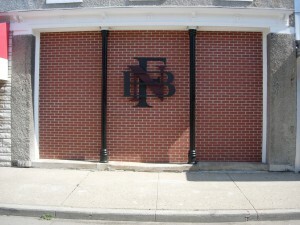 The letters are steel and were factory painted in the bank’s signature colors. They are bolted through the brick wall. The bolts holding them include 2″ spacers giving the logo a three dimensional effect. Framed by the existing columns, the logo helps tie the two buildings together. This look has certainly helped the appearance of downtown Monterey.